For people living with dementia (and their caregivers), night time can be the most challenging part of the day., dementia disrupts brain functions, and can cause confusion, memory loss, and changes in sleeping patterns. Dementia sleep disorders are common, and people living with dementia are more likely to have difficulty falling asleep and staying asleep throughout the night. No one is at their best when they’re not getting enough sleep, and for those living with dementia, the condition is often worsened by sleep deprivation, which increases lethargy, confusion, and irritation. People living with dementia may become more restless and agitated in the evening. Exercise is hugely beneficial for people living with dementia, and it’s also a great opportunity for them to socialise and enjoy the outdoors. Make sure that this doesn’t occur any later than four hours before they’re due to go to sleep. Low levels of Vitamin D can impact on a persons mood and thinking abilities. If you’ve ever had jetlag, you’ll know how beneficial sunlight can be at combatting it. The same is true for people living with dementia, and you should encourage your loved one to spend some time in the sun (with an SPF) in the morning. Since people living with dementia have a confused circadian rhythm, time in the sun can help reset their internal clock, increase alertness, and lower their risk of falling. A systematic routine can help reduce sleep disturbances and help with 24 hour reality orientation (orientation to the time and activity of the day). When people living with dementia have a proper routine and perform the same activities at the same time each day, they’re more likely to have a better night’s sleep. A nutritious diet is important for everyone, but people living with dementia can find it easier to sleep if their diet is supplemented with certain types of foods. Dementia sleep disorders can be lessened by eating foods rich in calcium, which can be found in dairy products like cheese and milk. That’s because calcium triggers melatonin, a sleep hormone. Grains like oatmeal raise blood sugar which can also promote sleepiness. At the same time, people living with dementia should avoid caffeine particularly in the afternoon, tobacco, and alcohol. These days, it’s common for people to watch TV and use electronics like phones, laptops, and iPads in bed. However, the blue light emitted by these devices can make it more difficult for people to fall asleep. Encourage your loved one to keep their bed just for sleeping, and if they want to watch TV or do any other activities, these can be done in another room. Make sure you understand how each type of medication works, so they can be given at the right time of day. You wouldn’t want to give someone a stimulant after dinner for example. 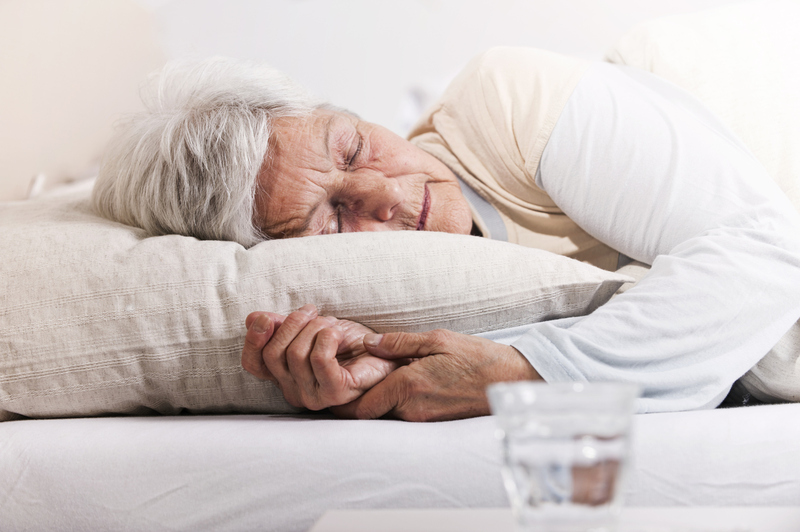 While it may seem like sleeping pills are a good option, these can lead to increased confusion, and risk of falls, and make it more difficult for people living with dementia to care for themselves. As you can see, dementia can have a massive impact on your loved one’s sleep patterns. By following the above tips, you’ll be better prepared, and can help them get as much sleep as possible. If your loved one is thinking about aged care, get in touch for a chat today.